YouTube Is Deleting Subscribers — Your Help? I really dislike making YouTube videos about YouTube, particularly when the title, albeit completely accurate, carries a “clickbaity” connotation. 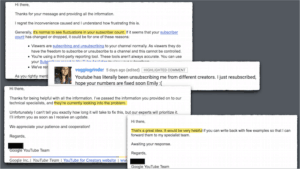 You may have heard of the “bug” in YouTube causing people to be unsubscribed from channels without their knowledge and creators loosing subscribers at alarming rates. There will always be fluctuations in subscriber numbers, and I've seen many periods of slowed growth. But in the last week, towards the end of my back-to-back speaking and vigil trip in Ireland and the UK, I finally had some time to get online for more than a minute and saw, for the first time ever, my total number of subscribers dropping by the minute. This was directly following my first ever live stream at a slaughterhouse in England. But in looking through comments, while there were and always are some viewers none to pleased, nothing spoke overtly of a mass exodus. If we look at my channel from the very start to the last 7 days, I've lost about 19.5% of the total subscribers gained. But, if we look at the last 28 days, I've lost 57% of subscribers gained. 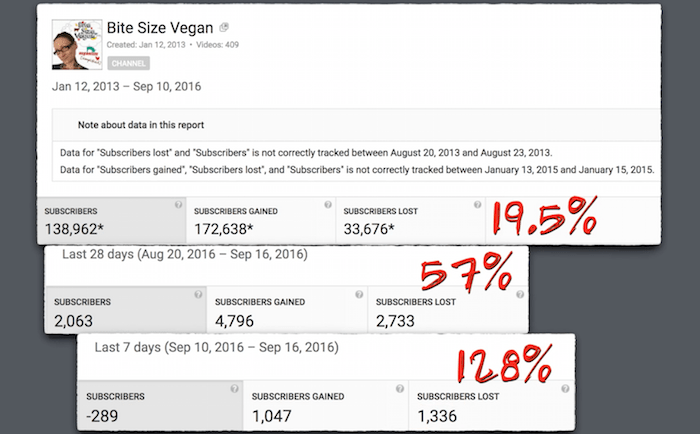 And in the last 7 days…uh, you can kinda do the math here: 128% of subscribers gained. Upon sending that comment, YouTube still didn't necessarily say it was a bug, but that they are working to fix it. Their support team had suggested to other creators, like That Vegan Couple, to send more examples of actual accounts having been unsubscribed. My suggestion to my support person to do the same was received as some brilliant new concept, amusingly enough. But if you happen to see this and find you are no longer subscribed, please let me know in the comments and I can send it along to the black hole of YouTube support. Oh and maybe re-subscribe … if you want. The system here is extremely weighed against content creators and in reality we have very little say over what happens with our channels. 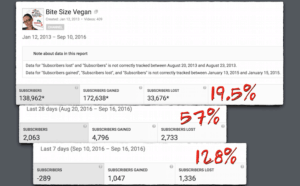 As you may know, YouTube unjustly censored my Extremism of Veganism speech, doing so in direct violation of their own policies. This isn't about views and certainly isn't about money—most of my videos end up having adds pulled anyways as they aren't “advertiser friendly”. But the channel's growth allows the content to reach more people. And accessibility to free education and accurate information is the entire goal of Bite Size Vegan. Finally, if you are subscribed, or if you re-subscribe, you have to still manually select to have notifications of new uploads. You can do so from your computer or mobile device. See this for more detailed instructions, if you're interested. Thank you all so very much for your support and for sticking with me through all the travel and talks and everything. I want you to know even if I'm not able to reply to every comment, that I appreciate every single one. Especially with all of the changes happening at once, it means the world to me that you're still watching and sharing. Even if I ever lose every subscriber, I'll keep fighting no matter what. And I hope you're there with me. Hang in there. By the way-how can Veganism EVER be extreme?? Also, I have always been astounded at the number of people tell me that a horse wants to be ridden. Is that why he/she bucks, you have to put a bit in their mouth, use a whip and or spurs? I have a sister who rode and who owned a very expensive thoroughbred-all I ever wanted to do was pet and feed it. Like any form of animal entertainment it’s just plain cruel. It’s also justified via their religion that these creatures were put here for our use. I am interested in advertising my product on your website -My product is for healing pets and vegans. I have no interest in helping non-vegans anymore. I am going to be marketing my product at vegan and veggie festivals. I am kicking off my first vending event…So Cal Vegfest, at Orange Coast College in Costa Mesa Halloween weekend. PS I gave up riding horses too, my horse is my best buddy, and riding him seems silly, the whole wearing a bit thing got me thinking about how insane it all is. He has lung damage from us being poisoned by the power company where we lived and the government when he was a baby. My hope is to get to South America to get away from the Fukushima Plume, with my cow, goats and horse. Please watch Dr Lauren Moret and Dr Helen Caldicott, on youtube regarding Fukushima, I want to save the vegans! Hate YouTube/Google … even more so since Snowden. Very disturbing behavior by YouTube. You are trying to educate people on the horrors of the meat industry. You are also bringing together vegans and vegetarians so we have like minded people to learn and share with.